…Is it a one-way ticket back to preinjury sport and optimal performance? We recently published a paper in the American Journal of Sports Medicine entitled “Return to Sport and Performance After Hip Arthroscopy for Femoroacetabular Impingement in 18- to 30-Year-Old Athletes: A Cross-sectional Cohort Study of 189 Athletes” (1). 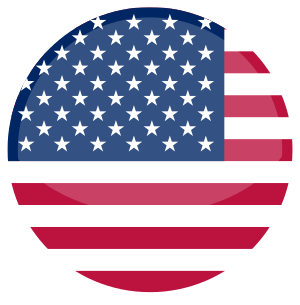 This blogpost serves as a short summery of the key findings. Femoroacetabular impingement syndrome (FAIS) has recently been defined in the Warwick Agreement as a motion-related disorder of the hip joint due to either cam and/or pincer morphology (2). FAIS is the most common diagnosis related to longstanding groin pain leading to surgical management (3)– most often using an arthroscopic technique. 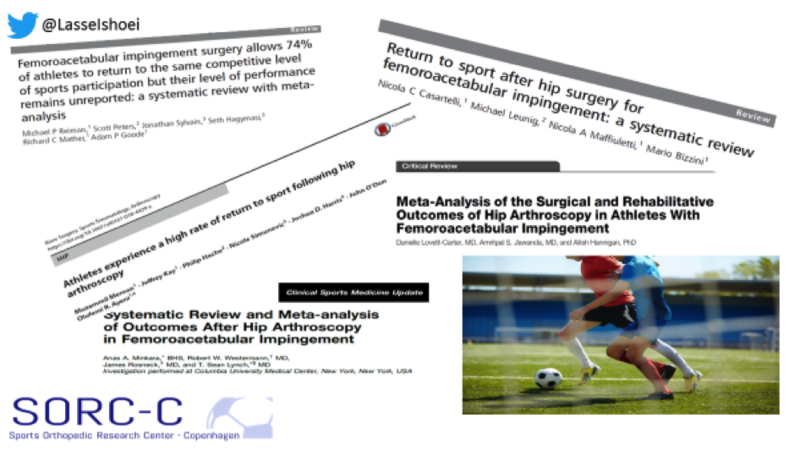 While several papers show improvements in hip function after hip arthroscopy for FAIS, a recent paper from our facility lead by Kristian Thorborg (4), observed that the majority of patients do not reach reference values in hip and groin function, including sport/recreational ability, measured with HAGOS (Copenhagen Hip and Groin Outcome Score) at 1-year follow-up. Despite these observations, several systematic reviews have indicated a high return to sport rate of 74-95% after hip scope for FAIS. However, systematic reviews are only as solid as the included studies, which often are associated with several limitations likely to affect the return to sport rate, such as: 1) poor and unclear definition of return to sport, and 2) surgery performed at high-volume hip arthroscopy centers by a single world-renowned surgeon. Furthermore, sport performance, which is often the most important parameter for athletes have rarely been investigated. Therefore, we designed a study to investigate the rate of return to preinjury sport at preinjury level in athletes and associated sport performance following hip arthroscopy for femoroacetabular impingement syndrome. 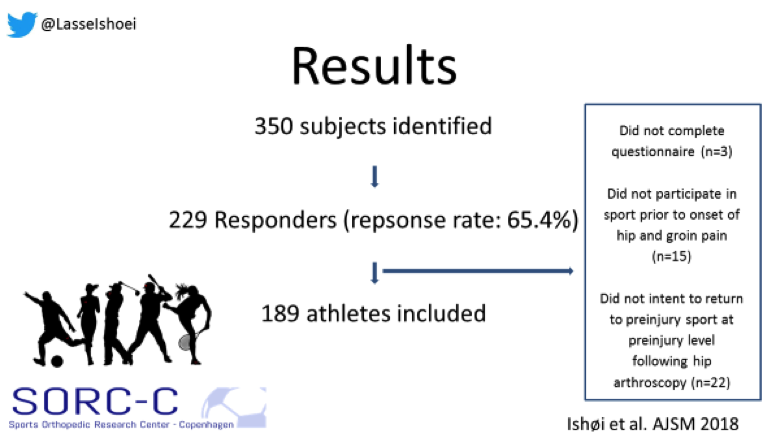 To overcome previous limitations associated with poor/unclear return to sport definitions and a single surgeon we: 1) defined return to sport as “return to preinjury sport at preinjury level” and assessed sport performance in accordance with a recent consensus statement on return to sport (5), and 2) included 189 athletes from 11 centers in Denmark using a nationwide registry (6). All athletes were between 18-30 years old (mean age 23) at the time of surgery and had hip arthroscopy for FAIS during the preceding 6 months to 6 years. Data were collected using a self-report return to sport questionnaire regarding preinjury and present sport and level. If an athlete reported that they were engaged in their preinjury sport at preinjury level at the time of follow-up, the associated self-reported sports performance was assessed as: 1) optimal performance including full sport participation, 2) impaired performance, but full sport participation, and 3) impaired performance including restricted sport participation (5). 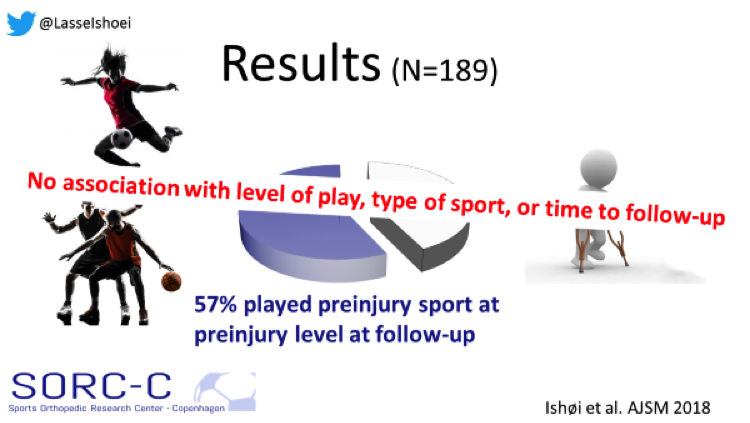 The main finding of the study was that 108 of 189 athletes (57.1%) were engaged in their preinjury sport at preinjury level at the time of follow-up (mean follow-up time: 33 months). Furthermore, of those 108 athletes engaged in their preinjury sport at preinjury level, 32 athletes (29%) reported optimal sport performance, whereas almost half of the athletes reported impaired performance and restricted participation, that is, unable to participate in all aspects of the sport (eg. match play or high-speed running). Again, no association were observed between sport performance and type of sport or level of play, indicating that a similar proportion of athletes in different sports or at different level (recreational vs. elite) reach optimal performance. However, in terms of time to follow-up, we observed that only 1 out of 12 athletes (8%) evaluated at 0.5-1 year reported optimal performance – this indicate that even though some athletes may return to sport short time after surgery, it is very unlikely that they will reach optimal performance within the first 1 year. 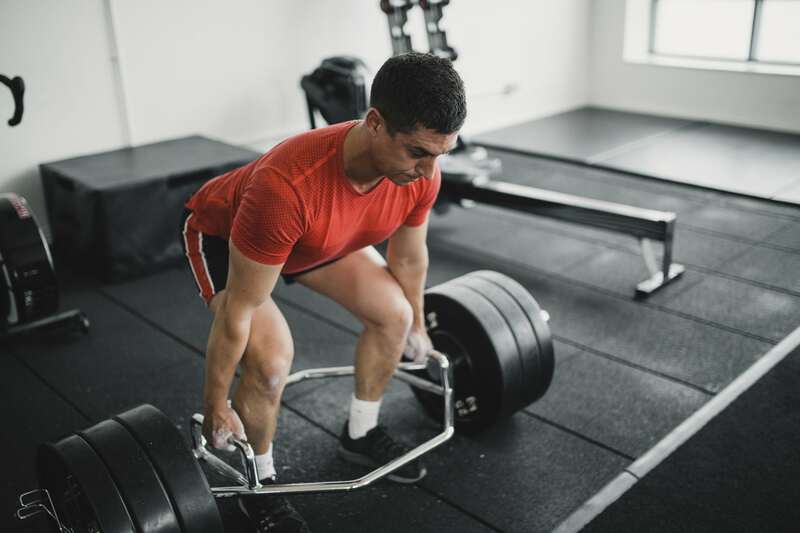 Of the athletes who did not return to return to preinjury sport at preinjury level or obtained optimal performance, the majority (>90%) reported this to be due to persistent hip and groin pain. The main reason why these findings are in contrast to previous findings on return to sport after hip arthroscopy may well be explained by our strict and clear definition on return to sport. As such another recent study by Tobias Wörner (7)using similar return to sport definitions as us, observed almost identical results as depicted in the below figure. 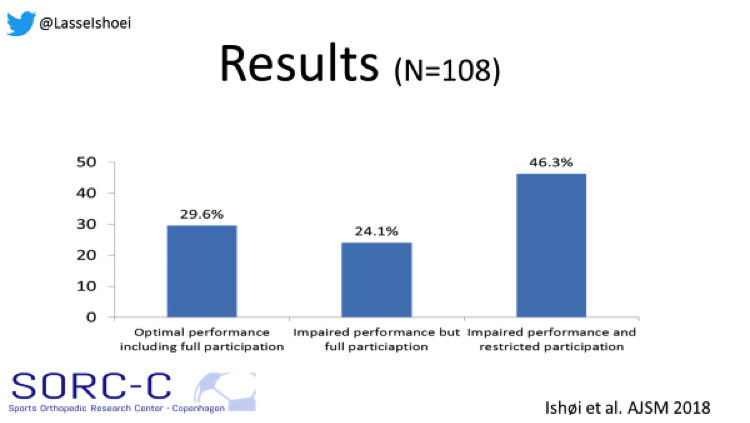 What is also evident from the figure is that the definition of return to sport clearly affect the outcome. In conclusion, our study shows that while a large proportion of athletes return to some form of sport, 57% return to their preinjury sport at preinjury level and of those only 1 out of 3 athletes corresponding to 17% of the total cohort return to optimal performance (1). Thus, hip arthroscopy may not be a one-way ticket back to sport as previously suggested (8). 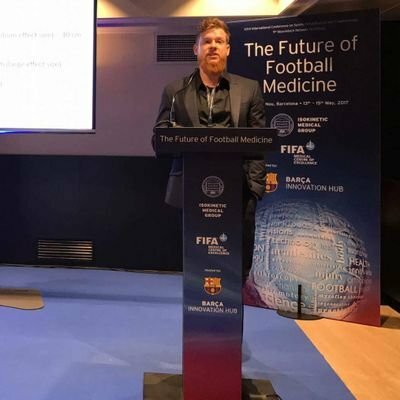 Lasse is a physiotherapist and PhD student at Sports Orthopedic Research Center – Copenhagen (SORC-C), the Department of Orthopedic Surgery and Copenhagen University Hospital in Amager-Hvidovre, Denmark. 1. 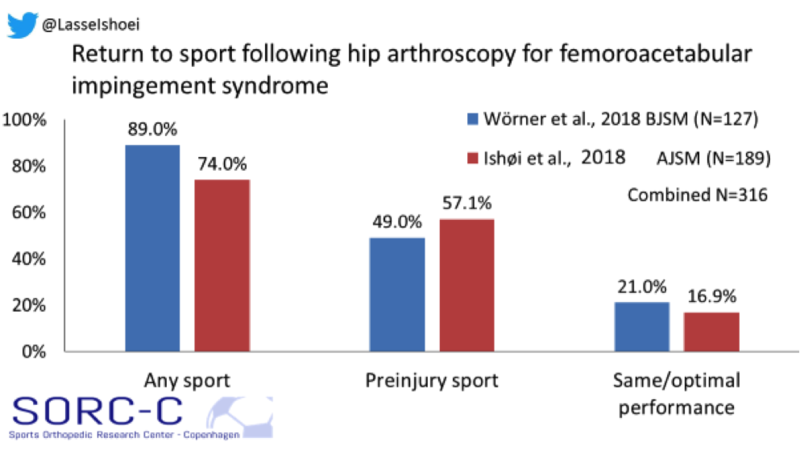 Ishoi L, Thorborg K, Kraemer O, Holmich P. Return to Sport and Performance After Hip Arthroscopy for Femoroacetabular Impingement in 18- to 30-Year-Old Athletes: A Cross-sectional Cohort Study of 189 Athletes. Am J Sports Med. 2018:363546518789070. 2. Griffin DR, Dickenson EJ, O’Donnell J, Agricola R, Awan T, Beck M, et al. The Warwick Agreement on femoroacetabular impingement syndrome (FAI syndrome): an international consensus statement. Br J Sports Med. 2016;50(19):1169-76. 3. De Sa D, Holmich P, Phillips M, Heaven S, Simunovic N, Philippon MJ, et al. 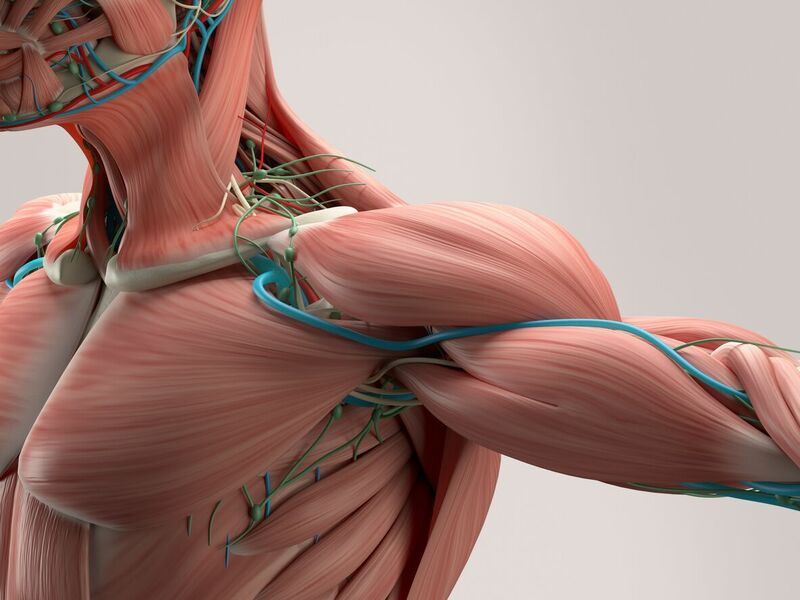 Athletic groin pain: a systematic review of surgical diagnoses, investigations and treatment. Br J Sports Med. 2016;50(19):1181-6. 4. 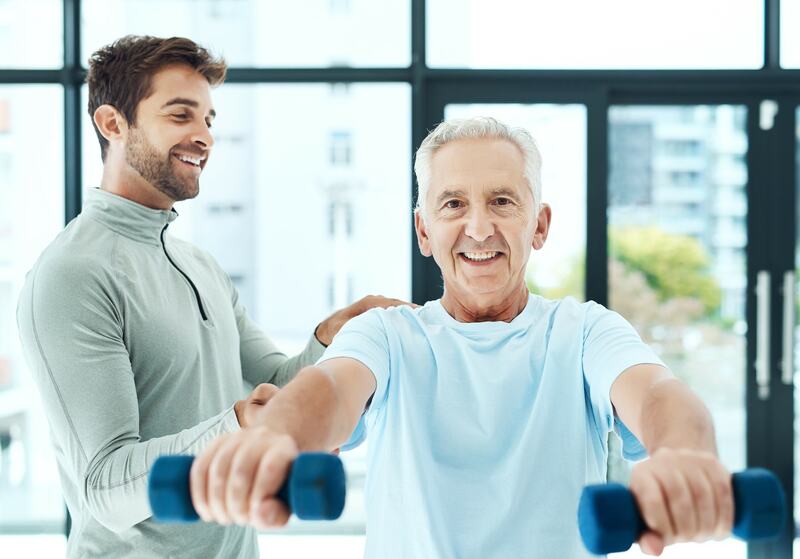 Thorborg K, Kraemer O, Madsen AD, Holmich P. Patient-Reported Outcomes Within the First Year After Hip Arthroscopy and Rehabilitation for Femoroacetabular Impingement and/or Labral Injury: The Difference Between Getting Better and Getting Back to Normal. Am J Sports Med. 2018:363546518786971. 5. Ardern CL, Glasgow P, Schneiders A, Witvrouw E, Clarsen B, Cools A, et al. 2016 Consensus statement on return to sport from the First World Congress in Sports Physical Therapy, Bern. Br J Sports Med. 2016;50(14):853-64. 6. Mygind-Klavsen B, Gronbech Nielsen T, Maagaard N, Kraemer O, Holmich P, Winge S, et al. Danish Hip Arthroscopy Registry: an epidemiologic and perioperative description of the first 2000 procedures. J Hip Preserv Surg. 2016;3(2):138-45. 7. Worner T, Thorborg K, Stalman A, Webster KE, Momatz Olsson H, Eek F. High or low return to sport rates following hip arthroscopy is a matter of definition? Br J Sports Med. 2018. 8. Kane P, Philippon MJ. Editorial Commentary: Put Me in Coach! Hip Arthroscopy Gets Patients Back in the Game. Arthroscopy. 2017;33(4):756-7.